You may want to read the short article below before you start looking at my North Adams articles. North Adams is a small city in the Berkshires. This strangely beautiful community is surrounded by hills dotted with rows of large tenements and Victorian houses, and the steep roads that wind up to them. Its incredible skyline of church steeples symbolizes the indomitable spirit of its residents. North Adams had a thriving manufacturing economy until the 1960s, and finally lost 4,000 jobs and its largest employer, Sprague Electric Company, in 1986. The factory’s 26 buildings are now the home of the Massachusetts Museum of Contemporary Art (Mass MoCA), one of the largest centers of art and performance in the world. It opened in 1999, and is averaging 150,000 visitors a year to its galleries and numerous performing arts events. In the 1960s and 1970s, an ambitious and largely unsuccessful urban renewal experiment was responsible for the demolition of more than half of the city’s downtown commercial and residential properties, and the forced relocation of hundreds of persons. Most natives over 60 years of age are still haunted by the memory of the things that aren’t there anymore. 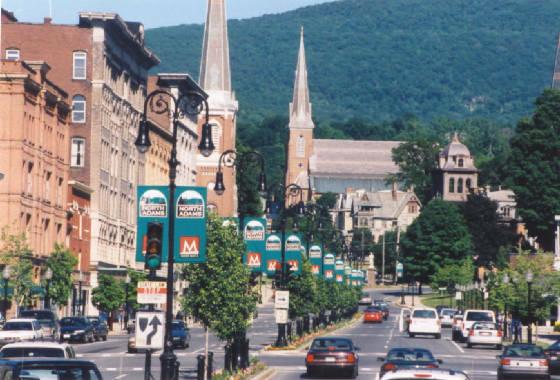 I visited North Adams for the first time on July 21, 1996, in order to find out about Mass MoCA, which had just received the necessary funding to complete the project. I was overwhelmed by the city’s spellbinding geographical setting, a reaction that led me to write several poems about it. I returned several weeks later to find out more, and became convinced that I could write a book about the city, using interviews with residents, photographs (both archival and mine) and my poems. That book, Steeples: Sketches of North Adams, was published a year later; and in 2001, I published Disappearing Into North Adams, a comprehensive examination of the city’s history and its unfolding transition to a center for art and culture. For nearly nine years, my visits always led me to the warm comfort of the Appalachian Bean Café, a welcoming restaurant and coffee shop started in 1996 by Audrey Witter, a young social worker. Her first child, Hannah, was born two years later, and spent much of her first five years playing in the café and socializing with the old-timers in the morning. The Bean, as locals called it, was a folksy cultural institution and an indispensable public space. Audrey closed it in 2004 to pursue a teaching career. My favorite place to hang out now is Brewhaha, another lovely cafe. Most of the articles about North Adams on this website were originally written for The Advocate Weekly, a former newspaper based in North Adams, and for iBerkshires.com.